Are Riskier Moves Ahead As P/C Insurers Strategize Investment Mixes? Is Ebola Compensable Under Workers Compensation? Emerging Risks: What’s the Next Asbestos? Powerful Predictions: How Much Is That New Insurance Customer Worth? Your Brand Is Your Business—Protect It! Can an InsurTech Startup Compete With Progressive and GEICO? Does Your Leadership Style Fly? Introverts in the Workplace: Are You Overlooking the Untapped Potential of Half Your Workforce? Can We Fix Earthquake Insurance in California? Are Insurance Carriers Ready to Jump Up Into the Cloud? Analyzing Analytics: When Does Value Of Predictive Modeling Outweigh Expense? The Changing State of Flood Insurance in the U.S.
What Might a ‘Cyber Andrew’ Look Like? The Future of Small Business Insurance Distribution: What Can We Expect? Record-Breaking Ice; Is Flooding Next? Actuarial Analysis of Automated Vehicles: How Much Premium Discount Is Justified? What Is the Meaning of Diversity in Asia? The Great Cyber Debate: Product or Peril? Are Building Products Making Us Fat? Careers Reimagined: Is the Insurance Industry Ready for Our Second Act? Do You Have the Vision to Innovate? Are You A Magnet For Talent? Price Optimization: A Dangerous Method? Could Cyber Insurance Benefit From Government Regulation? London Market: Center of Innovation or Stagnation? Business Email Compromise: Which Insurance Policy Pays? Trends in Smart Homes: What’s Next? Does, Should, Will TRIA Cover Cyber Terrorism? The Zebra CEO: Is Government Disrupting InsurTech? Sage Advisory Services, Ltd. Co.
Are You Ready to Follow the BYOD Trend? Where Should Insurers Look for New Markets? Is Cloud Computing Critical To Carrier Management? Can Driver Data Predict Collisions Before They Happen? Where Are the Thought Leaders in the Insurance Industry? Will HUD’s Disparate Impact Rule Have Say in Ratemaking? Stress Testing Your ERM Initiative: Is It Delivering What You Need? Usage-Based Insurance Apps: Opportunity or Obstacle? Where Have All the Chief Strategy Officers Gone? Commentary: Does FSOC Understand the Business of Insurance? Is FIO About to Step Into Data Collection? What Can Richard Branson Teach Us About Loyalty in Insurance? What’s Wrong With a Solvency II Approach to P/C Solvency Regulation? Big Data Analytics: What Are You Waiting For? Have You Shined Your Shoes Lately? Can InsurTechs Compete With Carriers and Agencies on Main Street? Soft Market Strategies: Is It Time for Reinsurers to Shrink Intentionally? 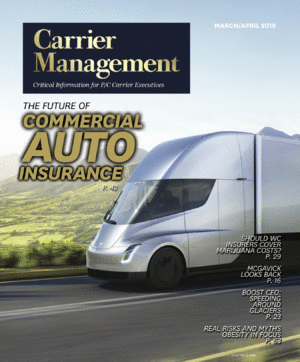 Are Carriers Facing a Paper Bias for Notices of Cancellation and Nonrenewal? UBI Insurance Is Not Usage-Based. Sorry, Not Sorry! Insurers: The First and Next Alternative Data Innovators? Your Insurance Brand: Status Quo, or Innovator? Agile or Waterfall: Which Deployment Makes the Most Sense for Insurance Carriers? Getting Well Soon: The Next Trillion-Dollar Industry for P/C Insurers? Mission vs. Vision: What’s the Difference? How Has the Global Terrorism Landscape Changed in the 15 Years Since 9/11?